Dinosaurs + knights = profit? dinosaurs + knights = ? I know what you're thinking. 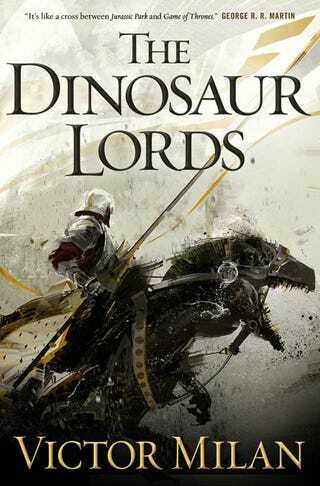 You want a book that's about a parallel Earth's 14th century Europe-style knight warfare, but you also want dinosaurs in it. Well, next year, Victor Milán will make all your dreams come true, if they are about knight warfare and dinosaurs. A world made by the Eight Creators on which to play out their games of passion and power, Paradise is a sprawling, diverse, often brutal place. Men and women live on Paradise as do dogs, cats, ferrets, goats, and horses. But dinosaurs predominate: wildlife, monsters, beasts of burden – and of war. Colossal planteaters like Brachiosaurus; terrifying meateaters like Allosaurus and the most feared of all, Tyrannosaurus rex. Giant lizards swim warm seas. Birds (some with teeth) share the sky with flying reptiles that range in size from batsized insectivores to majestic and deadly Dragons. As far as I can tell this book is coming out next year, even though it's supposed to have been coming out for a few years... So maybe things have been going awry for the author, who definitely needs to update his website.